KINYON ELEMENTARY SCHOOL: Library gets a new rug! The Parent-Teacher Organization at Kinyon Elementary School recently purchased a beautiful rug for the school's library. The library has been named, "The Pine Tree Library," and a parent, Mrs. Leasa Vorves, created "log" pillows to make the library comfortable. Mrs. Vorves also purchases a "Petoskey Stone" for all the students in the classroom. The Petoskey Stone is the State of Michigan's official state stone. 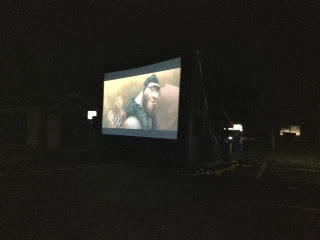 A big "thank you" to the Kinyon PTO and Mrs. Vorves for their efforts! Eureka Heights Elementary School third-graders recently took a field trip to DeBuck's Corn Maze and Pumpkin Patch in Belleville. It was an enjoyable day for everyone involved. Twenty-eight teachers will be going to the Wayne County Regional Educational Service Agency for a Common Core Math Institute session. According to Liz Biddle, school improvement coordinator in the district coordinating K-12 math through Title 1 funding for professional development, the teachers will be able to network with others in the district, as well as surrounding districts, while in attendance at the instructional session. They will receive training in technology and manipulative theories that they can use in their classrooms. 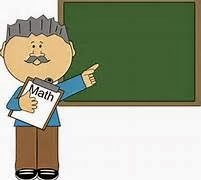 A coach is assign to them to model lessons and eventually provide feedback after observing them in the classroom. This is a great opportunity for Taylor teachers to receive some high quality professional development. 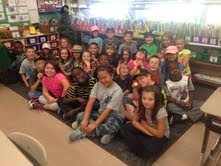 EUREKA HEIGHTS ELEMENTARY SCHOOL: Parents take a survey and write a letter! 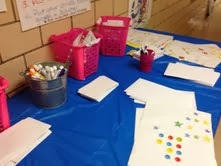 At Eureka Heights Elementary School, parents were encouraged to take a parental survey and write a letter to their student during recent Parent Teacher Conferences, according to Principal Stacie Hall. Parents took the survey in the computer lab and then wrote an encouraging letter to their offspring. 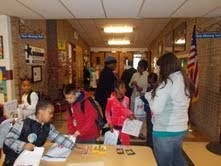 They also received a chance to visit the school's book fair with a goal of increasing reading at home. Pencil and paper are the common mode of operation in most elementary school classrooms, but Mrs. Gauss's class at Holland Elementary School is using other creative ways to accomplish its goals. On special days, Gauss's kindergarten pupils usual unusual methods for writing. 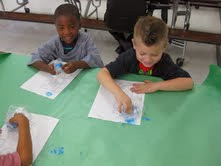 On the particular day photographed, the children did their writing as ice painting to trace spelling words. The children has a lot of fun and learned the long and short sounds of the letter "l."
Recently, the West Middle School Music and Media Class began selling their "Cardinal Chronicle," the first edition of the 2013-14 student newspaper. The chronicle featured articles including national news, upcoming events at West and even a hidden riddle. Connor Zachunke wrote about the recent government shutdown while Jennifer Nguyen authored the front page story about the volleyball team. Photos of the "Turn Off The Violence" event at Heritage Park are included, as is an interview of Mr. Kline by Nathan Bourdeau. Ethan Roberts reviews the movie, "Cloudy With a Chance of Meatballs 2." A cartoon, Dogie and Doofus, is offered, as is a horoscope. Its an easy-to-read, nicely packaged product. The Cardinal Chronicle sells for 50 centers during lunchtime. View the chronicle by clicking here. 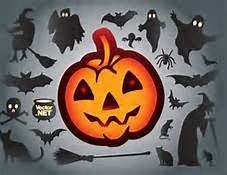 Looking for a safe halloween event? Look no further than Truman High School! Truman will host a safe halloween event Saturday, Oct. 26. It will be held from 6 to 8 p.m. and will be free. 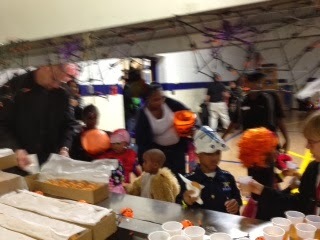 Children receive their "trick or treats" at the classrooms and play halloween games. There will be a bake sale, pizza, pop and water for $1 or less. There will also be a "Haunted Hallway" available for a charge of $1. Once a month, parents are encouraged to attend the "Time Out For Parents" meeting at the school. One Wednesday per month, these meetings inform parents of what is going on in their student's school and ways to get involved. 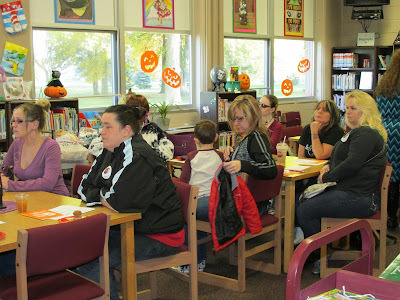 In addition, it presents a good time for parents to meet other parents who have children attending the school, compare notes and share ideas. Each month, a guest speaker presents the program. In these photos, the guest speaker with Kathy Carter, Region F Director of the Parent Teacher Association. For more information on this program, just call Taylor Parks at (734) 374-1246. Robert participates in Arts & Scraps. 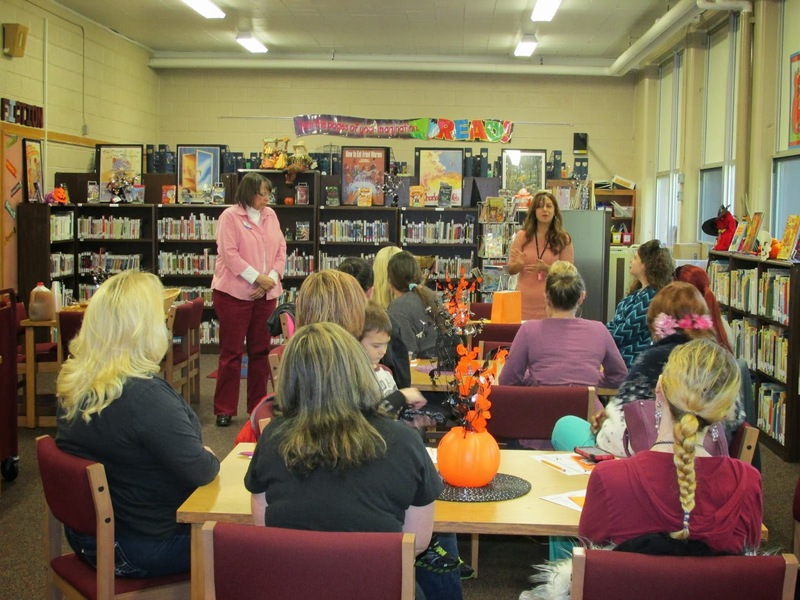 McDowell Elementary School recently held a unique event to engage families in the learning process. The parent engagement evening, "Arts & Scraps - New Found Fish" was attended by over 100 parents and pupils of the school. It started with a pizza dinner and quickly shifted into creative education. The children pretended that they were fishing along the Detroit River. They caught a fish that no one had ever seen before. Then they filled out a brainstorming web of ideas. Each child was given a bag full of recycled materials. Out of those, they created their new-found fish. Using their newly created fish and their web of ideas, they began to write stories about their fish. Each pupil was also given the opportunity to shop on the "Scrapmobile" for additional recycled materials -- all to keep the creative juices flowing back at home. For more on the Arts & Scraps program, click here. Just having fun with the project! Mr. Dana puts on the finishing touches! BLAIR MOODY ELEMENTARY SCHOOL: The 'odyssey' continues! 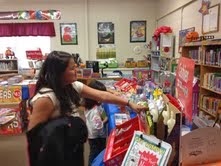 The Blair Moody Elementary School Scholastic Book Fair continues through this week. 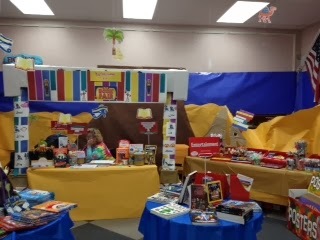 The school library has been transformed into a "Egyptian Odyssey" by parent volunteers. Stop by and take a look. 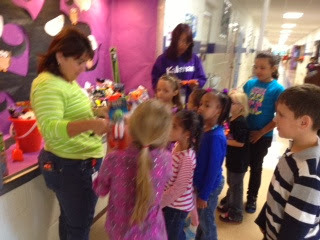 On Friday, Oct. 18, the much anticipated Halloween Raffle Tickets were drawn at Blair Moody Elementary School. Pupils bought tickets for a chance to win a bucket filled with prizes. 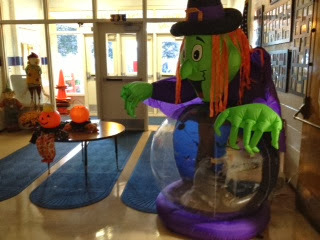 Families were invited for the school's third annual "Spooktacular." 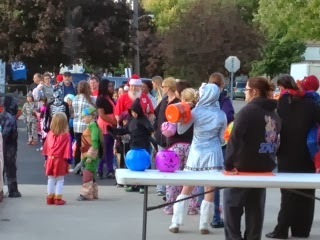 Children dressed in costumes and were able to trick or treat through the school. At the end, everyone was treated to donuts and juice. 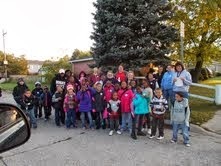 Blair Moody staff would like to thank Uncle Charlie's Orchard and Cider Mill for its generous donation of donuts! BLAIR MOODY ELEMENTARY SCHOOL: Children's reward comes with all the fancy frills! 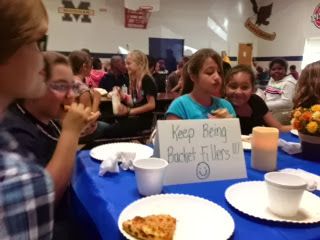 Blair Moody Elementary School's PBIS reward this month was a pizza lunch with a little different twist. The reward was a pizza lunch complete with fancy tablecloths, flameless candles and flowers. Pupils attending were able to bring a friend. 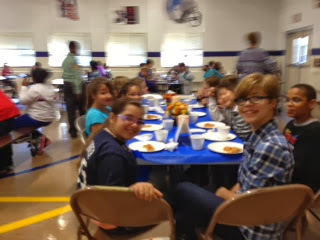 And their waitress for the lunchtime event was none other than Principal Tetreault! Nothing like plenty of pizza and plenty of fun before getting back to learning! 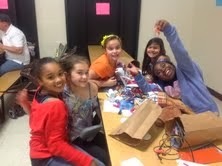 It's been very busy around Blair Moody Elementary School recently. Earlier this month, the 10th IMAX Mobile Unit event was held for a full day of learning -- and included an evening filled with fun. 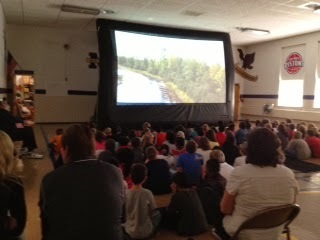 Pupils were treated to educational films such as "Thrill Ride" (the story of roller coasters) and "The Mysteries of the Great Lakes." 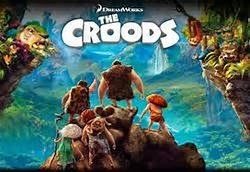 In the evening, a family movie night was held and children and their families gathered on the lawn for "The Croods." 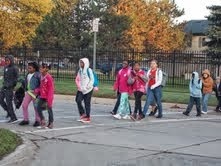 MYERS ELEMENTARY SCHOOL: Teachers and pupils enjoys 'Walk and Roll' to school day! 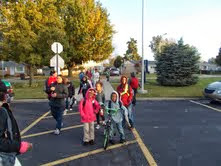 Myers Elementary School recently completed its eighth annual Safe Routes to School "Walk and Roll" Day on Friday, Oct. 18. School staff were out in the neighbors around the building walking to school with their pupils. Some staff were even dropped off over a half-mile away in the apartment complexes to accompany children walking to school. 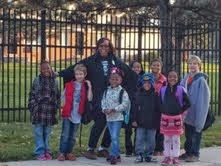 Principal Diedre Zockheem joined a bus route at one of the bus stops and rode to school with some of the students. Several Taylor School District administrators, members of the school improvement and state and federal departments, also joined in fun. Sponsors included HealthLink EMS, the American Heart Association, AAA of Michigan, Little Caesar's of Taylor and, for the first time, the National Kidney Foundation. 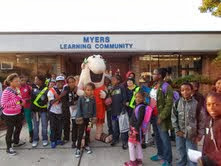 The heart association, AAA and the kidney foundation handed out literature, stickers and bags of goodies for the children as they entered Myers. This event would not happen if it wasn't for the dedicated hard work of school Social Worker Marilyn Vargo, who does an outstanding job of putting everything together. Principal Zockheem joins the bus stop! Little Caesar joins the celebration! Parent-teacher conferences at Kennedy and Truman high schools are scheduled Thursday (Oct. 24) afternoon and evening at both buildings. There are no afternoon classes for high school students, grades 9-12, that day. For further information, contact either school. Remember, there is no school this afternoon for children in kindergarten through sixth grade, due to parent-teacher conferences throughout the district. 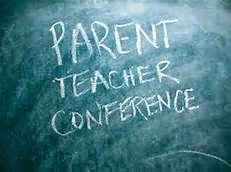 Parent-teacher conferences, K-6, are scheduled to be held this afternoon (Tuesday, Oct. 22) and Wednesday (Oct. 23) in the afternoon and evening in schools throughout the district. Check with your child's school for further information. 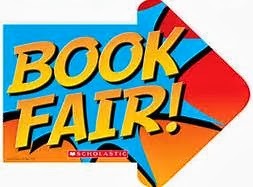 BLAIR MOODY ELEMENTARY SCHOOL: Book fair continues throughout week! 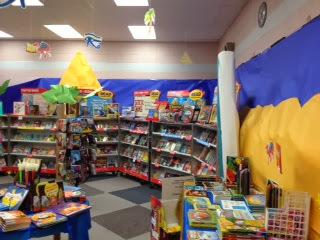 The scholastic book fair at Blair Moody Elementary School continues today and runs weeklong between the hours of 9:30 a.m. and 2:30 p.m.
Great chance to get a good deal on books! 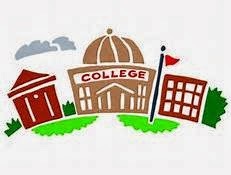 MELISSA SKOPCZYNSKI: 'College day' a big success at Truman! The weeks seem to be going by faster and faster. It is hard to believe that we are already at the halfway mark for the trimester. A big “thank you” to the Truman Counseling Department for putting on an awesome college onsite day for our students. 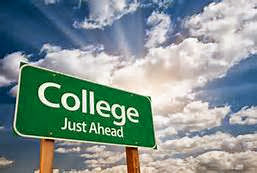 I do not have final numbers, but we had many students leave the media center with a smile on their face knowing that they had been accepted to the college of their choice. They were dressed in a professional manner and represented themselves very well. This is the type of thing that makes being an educator worth it. It should be noted that we are one of the only schools Downriver that offers this to our students. Today alone 21 out of the 30 students that applied were accepted to Michigan State University. Sparty On! A friendly reminder that progress reports are due Tuesday (Oct. 22) and we have a staff meeting Wednesday (Oct. 23) after school. 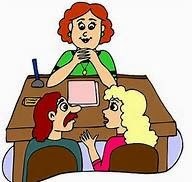 Parent-Teacher Conferences are Thursday (Oct. 24). If for some reason you cannot attend, please let me know. Friday, the varsity football team hosts Melvindale. Please try to attend and support the team. And a special thanks to the Pep Band for all of their support. Remember: This is YOUR team, this is MY team, this is OUR Team. Together, we are making a difference. TOMMIE SAYLOR COLUMN: Remember, it ain't over until we win! When I was a young teacher, my wife worked late afternoons, leaving me to care for our children in the evening hours. One evening as I was getting my daughter ready for bed, we decided to play a simple board game before heading upstairs (which later became our normal bedtime routine). I do not remember the name of the game, but what I do remember is thinking that if I hurry up and win the game, I can get it over with and quickly get her to bed. You see, as a young teacher I had lessons to prepare and papers to grade. So I pushed for the win, and won the game relatively quickly, as would be expected – she was only 6 years old. 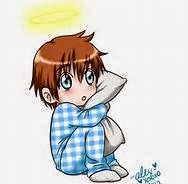 Thinking that we were done, I told my daughter that I was going to put the game away and she needed to head upstairs to bed, I would be there shortly to tuck her in. My daughter looked at me and said, “But it ain’t over until I win.” Intrigued, I decided to play the game with her again – and again and again – not giving her an inch just to see how far she was willing to go. On that day, my little girl taught me a lesson – it ain’t over until I win. The path to success is long and hard, and you do not lose and/or fail until you quit. Never give up and never give in until success is firmly in your grasp. All of your past failures are meaningless once you have won. It ain’t over until you win. Often the difference between success and failure is vigilance. It is easy to throw up your hands and quit. Only the brave drive on in the face of adversity. Our individual efforts are the only thing standing in the way of our goal.